Hermiston Brewing Company The Nookie's Restaurant home of the Hermiston Brewing Company & Tap House is located in the center of Hermiston, where the 5 main highways feeding the city intersect. The property consists of a historic 6000+ square foot facility and 125+ parking spaces located in the heart of the Hermiston Oregon business district. Both the interior and exterior design and colors include the original massive tamarack beams which bring a beautiful addition to the city where over 15 beers produced in house are served daily. The restaurant has a range of delicious menu items that is sure to satisfy all who stop by. The brewers brew regularly during the business hours and they welcome tours and questions about the process. The beer list is updated often two to three times a month. New beers are continuously being crafted so make sure to stop by and keep updated what's going in the brewery. 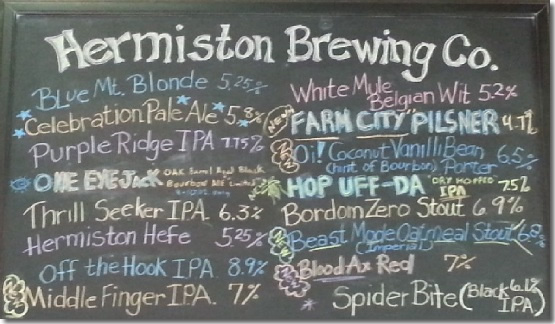 Hermiston Brewing Company is kid friendly each day until 9pm.